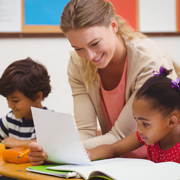 The following organizations provide valuable resources to early childhood educators. They are not structured as membership associations. "The Office of Child Care supports low-income working families through child care financial assistance and promotes children's learning by improving the quality of early care and education and afterschool programs." "Head Start promotes the school readiness of young children from low-income families through agencies in their local community. Head Start and Early Head Start programs support the comprehensive development of children from birth to age 5, in centers, child care partner locations, and in their own homes." This Licensed Provider Resources page offers information for those who are licensed and those interested in becoming licensed. This local branch of the Great Start to Quality organization provides an abundance of support for your early childhood education program. From their Lending Library of materials to Training Events for staff, they are available to enrich your program. Create and sustain a collaborative and coordinated community effort that provides culturally relevant and high quality services that support, empower and engage ALL Oakland County families and children as active members of the community from the prenatal period to age eight. "Oakland Family Services is a private non-profit organization in southeast Michigan, providing prevention, education and treatment services in the community since 1921." Oakland Schools offers workshops for early childhood educators that focus on addressing challenging behaviors and promoting the social and emotional competence of infants, toddlers, and young children. Phone consultation with an early childhood mental health consultant is also available for infant, toddler, and preschool staff. Contact our early childhood behavior support hotline at 248.209.2366. "Early Childhood works collaboratively with Oakland County schools, families and communities to develop a systemic approach to support the development and academic achievement of all children from birth to Kindergarten. " Early On® Oakland is a system of services for families of children birth to three years, who have a health condition or a developmental delay. The system includes a collection of activities, supports, services and resources provided by many different agencies and programs. Early On® Oakland helps you find the individual support that your child and family needs. "Parents as Teachers helps organizations and professionals work with parents during the critical early years of their children's lives, from conception to kindergarten." It provides curricula development, training, and advocacy in early childhood policy. "Reggio Children - International Center for the Defense and Promotion of the Rights and Potentials of All Children - is a mixed public-private company established in 1994 on the initiative of Loris Malaguzzi and the commitment of a group of local citizens, with the aim to manage the educational and cultural exchange initiatives that had been taking place for many years between the municipal early childhood institutions of Reggio Emilia and a large number of educators and researchers from around the world. The company aims and purposes are inspired by the contents and values of the educational experience of the Municipal Infant-toddler Centers and Preschools of Reggio Emilia, and its mission is to carry out experimental research, to promote and disseminate high quality education worldwide."